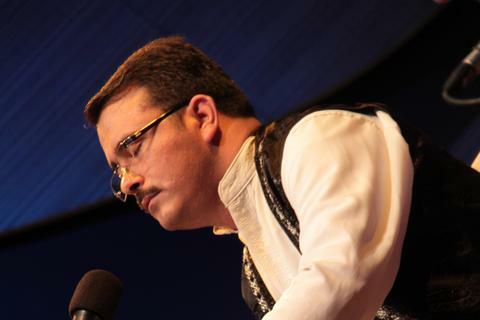 Gochag Askarov (b.1978) performs Mugham, a classical genre of Azerbaijani traditional music proclaimed by UNESCO a “masterpiece of oral & intangible cultural heritage of the humankind”. It is a music of great emotional power and sophistication that, despite its archaic musical language and ancient poetic texts, has a universal and contemporary appeal. Gochaq Askarov is only one of a handful of mugham artists, such as the great master Alim Qasimov, to have established an international career, introducing to audiences around the world this great and unique art form. The western musical press often compares his singing manner with that of Nusrat Fateh Ali Khan, the great Pakistani Qawwali singer. Gochag Askarov`s voice of almost three-octave range is capable of conveying drama, passion, or moving the listener by melancholy, or captivating by bright virtuosity. Gochag Askarov started singing since his childhood and was possessed by desire to become a professional singer. He studied Mugham and traditional vocals at a primary music school, then at the Baku Music College and, finally at the Azerbaijan National Conservatoire with renowned Mugham singers. Along with that, he used to listen to many of Azerbaijani classical singers of the past. But the vocal art of an outstanding Azerbaijani singer, UNESCO Artist Alim Gasimov has had a particular influence on his singing style and innovative approach to Mugham.